Nothing gets me hyperventilating more quickly than rich countries allowing citizens lacking power and privilege to suffer in ways that are, at least to some extent, preventable. Believe me, I am well aware of my own country’s shameful treatment of the powerless. But the cruelties we reserve for the hungry, the uninsured, the disabled, and the poor are old news. I already watched the horrors of Katrina unfold. But I honestly can’t say that, before the age of the Internet, I fully appreciated the seemingly limitless examples of wealthy societies that seem incapable of providing the most basic protections to those who might die without them. My favorite recent example of journalism shining a light on suffering amidst wealth was George Packer’s shattering portrait in The New Yorker of the slums of Lagos, Nigeria. If you have a strong stomach, read the piece and see the quality of life that the world’s 12th largest oil producing country reserves for its poorest citizens. 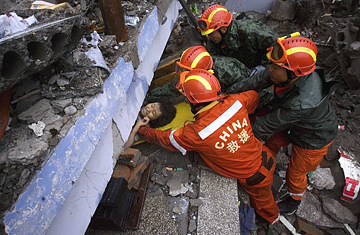 And now the Sichuan earthquake. This week, virtually every new media technology brought us horrifying details of how the Chinese economic miracle had apparently not been quite miraculous enough to insure basic standards of safe school construction. Richard Spencer, reporting from Sichuan province for The Telegraph, tells a chilling story of promises broken and young lives lost. Faced with this tidal wave of revelations, Chinese officials were forced to promise a rigorous investigation resulting in severe punishment for those at fault. Smooth. Really smooth. And straight out of the authoritarian propaganda playbook: We’ll root out those at fault and punish them. “If quality problems do exist in the school buildings, those found responsible will be dealt with severely,” said Housing and Urban and Rural Construction Minister Jiang Weixin. I just had a sickening thought: Given the authoritarian impulse to quickly cover up crimes and negligence, at least Jiang Weixin will probably have those schools fully rebuilt before the reconstruction of New Orleans consists of anything more than Bush administration photo-ops. The Chinese government are angels compared to the Myanmar military junta’s handling of its recent disaster. While it is always risky deciding which tyrant is more tyrannical, you’ll get no quarrel from me Dominic.